Ahoy thar Son of a Biscuit Eater! Apps Pirate is a daily app reviews blog that covers news, software, tips and how to do guides for smartphones. Our goal is to provide in-depth, fresh iOS and Android news, updates, apps reviews, and tips for all ya Smartphone users out there! We’ll do our mighty best to give you app reviews for iOS and Android devices. Aye, informing you with the breaking news isn’t enough for us, we also do it with style – our crew writes interesting and intelligent articles, filled with humor to give you the total breakdown on how to get the most out of your Smartphone! Savvy? Avast! You are an App junkie, Aye? We too. Me and my mateys love to follow everything related to Apple, iOS and Android! We’ll do our best to bring in the latest Smartphone technology developments and review the top apps in the App Store and Android Marketplace. Sink me! Straight to Davy Jones’s Locker! 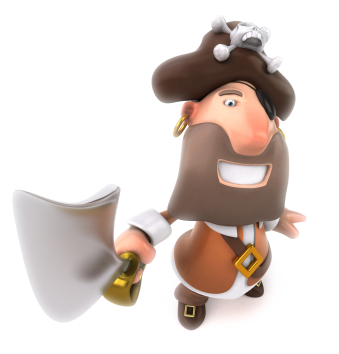 Our community and lovely pirate crew of sea dogs is growing like a blaze! Aye, there will soon be Pirates lying on the sand and drinking Grog everywhere! We invite you to join our community and spread the word to the seven seas! Apps Pirate is the perfect place to publish your App to a gazillion of iPhone and Android fanatics! Ahh, sweet trade i say! For inquires, send an email through the contact page. Sometimes we’ll use affiliated links in our blog order to get a hold of some precious Pieces o’ Eights, be that booty aye?! But mainly for drinking Rum!